Is China losing the trade war against America? WHEN Donald Trump tweeted on August 5th that tariffs were working “big time”, American media sprang into action to test the claim (see article). In China, editors were more circumspect. No major Chinese-language newspaper reported his tweets. One of his claims—that China’s stockmarket has fallen 27% in the past four months—was an exaggeration. But why would any self-respecting propagandist in Beijing dwell on that? Chinese stocks have indeed fallen sharply (see chart), which officials do not wish to emphasise. Upgrade your inbox and get our Daily Dispatch and Editor's Picks. And this is just one of a series of awkward facts for China as its trade war with America deepens. The yuan is down 8% against the dollar since April, and near its weakest in more than a year. A shrinking trade surplus produced a current-account deficit in the first half of 2018, China’s first such gap in at least two decades. More broadly, China’s growth is slowing at a time when America’s economy is expanding at its fastest pace since 2014. No wonder Mr Trump feels that he is on the right path, and that Chinese investors are jittery. Making matters worse for China is a whiplash effect. Until recently officials and executives believed their own declarations of technological prowess. Privately, advisers were confident that Mr Trump could be placated with promises to ramp up imports from America. Now both views look wanting. An agreement for China to buy more American natural gas and soyabeans collapsed in June. Chinese officials are keenly aware of vulnerabilities; had America maintained its sanctions on sales of semiconductors to ZTE, the Chinese telecoms giant might well have gone out of business. Those with a conspiratorial mindset see things in a darker light. “The Americans don’t want a deal. They want to screw us,” says a fund manager. The asymmetry in the trade war is another uncomfortable fact. Since America buys far more from China than vice versa, America has more scope to impose tariffs. This imbalance, long discussed in theoretical terms, is close to becoming a hard reality. Mr Trump has instructed his trade team to consider 25% tariffs on $200bn of Chinese imports as early as September, taking the total affected by its tariffs to about $250bn, with room for twice that amount. China’s threatened retaliation, announced on August 3rd, will be tariffs on $60bn of American imports. This would take the total under its tariffs to $110bn, with little room for more. China has other weapons at its disposal. It can disrupt the lucrative Chinese operations of American businesses, from Apple to Starbucks. But that would have downsides. Declaring bogus justifications (health violations, say) would reinforce foreign criticism of government meddling in China’s economy. And the nature of such interference, unlike tariffs, is that it will not be announced in advance, meaning it can take longer to register the impact. 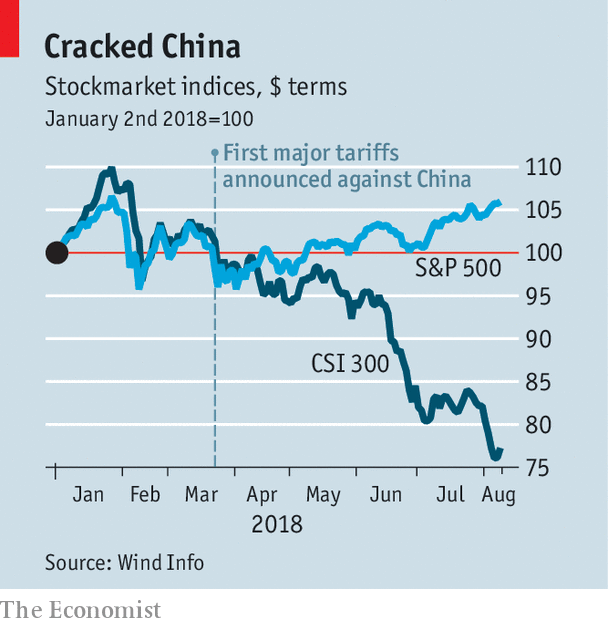 The timing of the trade war is most inconvenient for China. Over the past two years the government has waged a campaign to rein in debt levels. Finally this has started to bite, with credit growth slowing sharply. Officials could opt to abandon their tightening stance in order to counteract the trade turmoil. But that might erase the gains from the deleveraging. This explains their restraint so far. At a meeting of the Politburo on July 31st, China’s leaders noted that it was a priority to support growth amid the “clear change” in the external environment, but also pledged to press on with their efforts to control debt. Investors who had hoped for more easing were disappointed. So there is cause for concern about China’s growth outlook. But markets may be unduly pessimistic. One conclusion from the past few weeks is that policymakers now accept that the trade war is real, and are starting to cushion the economy. The boost to exports from the falling yuan, down about 6% on a trade-weighted basis since mid-June, should be “roughly proportionate” to the blow from the first $50bn of American tariffs and some of the next $200bn, says Andrew Tilton, the chief Asia economist at Goldman Sachs. At the margins, he adds, China is shifting to a more active fiscal policy. Officials have made it easier for cities to get funding for infrastructure projects. One government adviser says there is discussion of a bigger stimulus, likely to be focused on promoting consumption rather than investment. The economic backdrop to the trade war could also change over the next year. As China tiptoes towards easing, its credit growth should pick up. Meanwhile, America may be near the top of its growth cycle, with gains from last year’s tax cut set to dissipate. Louis Kuijs of Oxford Economics, a research firm, says the divergence in their stockmarkets might reflect overconfidence in America and an evaporation of confidence in China. “Both reactions seem exaggerated,” he says. With no resolution to the trade war in sight, there will be time enough to test this proposition. This article appeared in theFinance and economicssection of the print edition under the headline"Is China losing it?"